Planning a Trip to Thailand? Clicking Pictures on This Phuket Beach Could Land You in Jail or Even Death Sentence! Phuket is a very popular tourist place and most people who visit Thailand always pay a visit to this exotic island location. 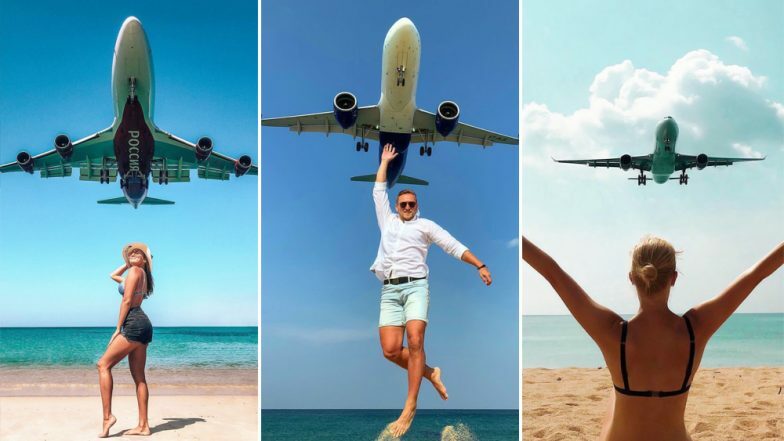 While every tourist clicks pictures on the beach, clicking selfies on Mai Khao beach while the planes are landing can be charged with a death sentence. The international airport for Phuket is just along the Mai Khao beach with the beautiful Andaman Ocean waters surrounding it. So as the aircraft lands, it passes close to the sands and thus makes an attraction for the people on the beach. Most tourists find it attractive to click pictures with the landing aircraft in the background. It is very distracting for the pilot and tourists are thus banned from entering the area. Those trespassing the area can face a death sentence. Boeing Passenger Plane Hits and Kills Armenian Man on Runway at Moscow Airport. Taking pictures along the sandy stretch of the beach with an aircraft landing over sure makes for an appealing picture to upload on social media. In fact, the Mai Khao beach is known all over for the very feature. But henceforth, taking such pictures can face between five years and life imprisonment. And the worst offenders won't be spared from capital punishment. The Phuket International Airport is cracking down on visitors who come to take selfies and pictures with the approaching aircraft. Because it heavily disturbs the pilots and could cause untoward incidents. Selfie Kills! Indian Boy Falls Off to Death From a Tourist Spot in Australia. Authorities are developing a safety zone near the runaway where no tourists will be allowed. But people are figuring out how will this regulation be even imposed. An initial meeting to decide this area was held last month. "The airport wants to boost tourism revenues, but at the same time, it must make sure there will not be any problem with aviation regulations … Tourism and safety must coexist," said deputy Phuket airport chief Wichit Kaeothaithiam to Bangkok Post. However, locals say the new rules would impact tourism in the area. Because restricting the area would also mean closing the entrance of the beach. It thus remains to be seen how much of a restriction gets imposed on the most popular beach here.